The ECN Cairngorm site is owned by Scottish National Heritage, a Scottish government funded body that looks after Scotland’s landscapes whilst research is managed by Centre for EcologyThe study of living organisms in their environment, including where they are found and how they interact with their physical environment and with each other, for example through food webs.... More and HydrologyThe study of water in the environment, particularly its amount, movement and quality. It encompasses water in rivers, lakes, glaciers, soil and underground aquifers. The way in which water (liquid and... More. ECN stands for the UK Environmental Change Network, and is the UK’s long-term environmental monitoring and research programme. The ECN makes regular measurements of air, soil, water, and a range of animals and plants across a network of sites to determine how and why the natural environment is changing (see www.ecn.ac.uk for more information). The ECN Cairngorm site is a north facing granite catchment overlain with peatPeat is a soil type formed from slowly decomposing vegetation. It is found in wet areas where the lack of oxygen slows the breakdown of plant matter. Peatlands are areas... More situated in the Cairngorms Mountains of Scotland (57°07’ N, 03°49’ W), rising from about 350 m through the tree line at 500 m to the highest summit at 1111 m. The catchment area is 10 km2. The site is part of the Invereshie and Inshriach National Nature Reserve, and forms part of the Cairngorms National Park. The catchment is composed of a wide range of ecosystems from pine forest at low altitude, through bog communities on ground with impeded drainage, to alpine vegetation including moss and lichenLiving organisms consisting of two organisms, a fungus (a mycobiont) and a photobiont, living together in a body called a thallus. The photobiont can use light energy to produce sugars.... More heaths on the highest ground. The charismatic capercaillie, a member of the grouse family (IUCN Red listed) is found in the pine woods along with pine martin. Several species of deer can be found grazing a variety of habitats from the forests to the summits. The site has virtually no natural tree line due to past overgrazing but is now being extensively re-colonised by Pinus sylvestris. From the middle of the nineteenth century the site was mainly used as deer forest, as part of a large sporting estate in private ownership (Invereshie Estate). It became part of the Cairngorms National Nature Reserve in 1954. 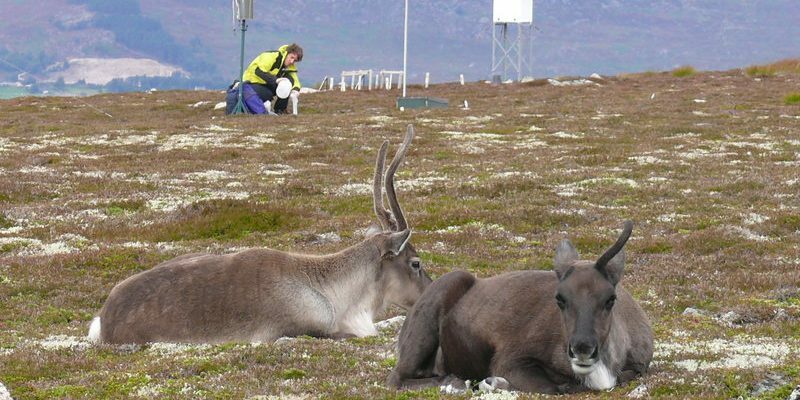 Ecological and environmental research has been undertaken in the area since the early 1960s and the site joined the Environmental Change Network of the UK in 1998. There are no buildings on the site but accommodation for a small number of visitors can be arranged on site (camping), and there are local hotels and guest houses nearby. Research on the site includes both terrestrial and freshwater environmental monitoring as part of the ECN and also as part of the Austrian GLORIA programme (www.gloria.ac.at/) examining temperature effects on vegetation across Alpine Europe. The site has been the subject of intensive hydrological and snow related research since the early 1990s. The Cairngorms area has been the focus of many land use change and tourism impact studies since c. 1980s and the data is being used in current ecosystem serviceA benefit provided by an ecosystem that humans enjoy, such as clean water, healthy soils or prevention of erosion. The Millennium Ecosystem Assessment identified the following groups of ecosystem services: Provisioning services (e.g. food,... More research. The research site is uninhabited and used for recreation; hiking, trekking, and mountain biking. Aviemore, the nearest town, has a population of around 2500 and became one of the first skiing resorts to be established in Scotland with the opening of the chairlift in 1961. The resort has since grown into the UK’s most visited ski resort during the winter months.